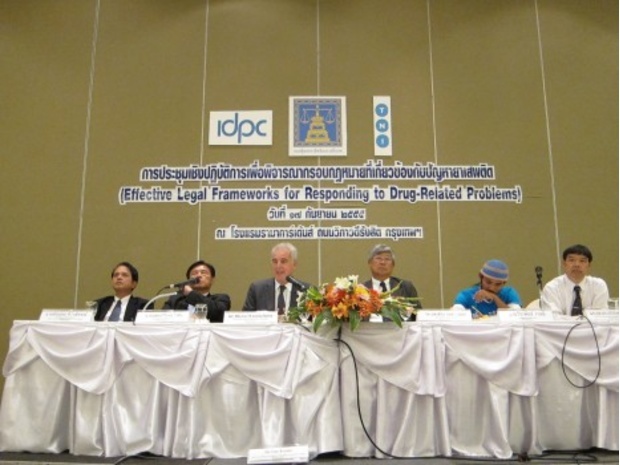 On Monday 17th September, 2012, IDPC together with the Transnational Institute (TNI) held a high-level seminar in Bangkok co-hosted with the Thai Ministry of Justice Rights and Liberties Protection Department to discuss and review effective legal frameworks for managing drug-related problems. It was a crucial moment for such a discussion as the Thai government recently announced plans for the mass rehabilitation of up to 400,000 drug users in what essentially amounts to compulsory detention centres run predominantly by the Thai military in their ongoing push to make the country drug-free. Thailand has become the unfortunate poster child for punitive drug control policies that have failed to reduce or eliminate drug use, and instead resulted in negative and damaging consequences. Since ex-Prime Minister Thaksin Shinawatra declared a war on drugs in 2003 that resulted in nearly 3000 extra-judicial killings, Thailand has repeatedly come under fire from the international community for an overly punitive approach to drug control that de-prioritizes health and human rights outcomes in favour of zero-tolerance ideology on drug use. The current administration, with Mr Shinawatra’s sister at the helm, Prime Minister Yingluck, declared a new war on drugs last year although there were assurances that the human rights abuses committed in 2003 would not be repeated. The willingness of the Thai Ministry of Justice to co-host the high-level seminar with IDPC and TNI shows that there are parties in Thailand concerned with the existing policies and keen to bring international experiences into the national debate. The political space for this kind of discussion is extremely limited and the issue of drugs continues to be a very sensitive matter for policy makers but this event brought together several key actors in Thailand, including representatives from the Office of the Narcotics Control Board (ONCB), Thanyarak Institute (the government body responsible for drug treatment in Thailand), Thai law enforcement agencies, 12D network (representing 12 Thai civil society organisations advocating on harm reduction), Asian Harm Reduction Network, Asian Network of People who Use Drugs, academics (Thammasat University and Chiang Mai University), and United Nations agencies based in Bangkok (UNAIDS, UNDP and UNODC). International participants included Michel Kazatchkine, representing the Global Commission on Drug Policy and former Senator for Bangkok Jon Ungphakorn of the Global Commission on HIV and the Law. These two Commissions are the most recent voices of concern to highlight Thailand’s alarmingly high rates of HIV among people who inject drugs, and the fact that the epidemic is fuelled by the country’s draconian drug control policies. TNI and IDPC representatives also spoke at the event, highlighting global trends in the drug policy debate, including reforms taking place in Latin America that signal a move away from strongly punitive legal frameworks towards more pragmatic and evidence-based approaches. Dr Kazatchkine was very frank in his intervention, saying that Thailand’s war on drugs had failed by ‘every metric you can think of’. He condemned the failure to adequately address the spread of HIV among people who inject drugs and also to ensure adequate access to anti-retroviral medicines for those who had become infected with the virus. This was a major disappointment especially after Thailand’s laudable response to HIV related to sexual transmission almost 20 years ago with the 100 percent condom campaign. Jon Ungphakorn also expressed his dismay at the continuing obstacles to the effective provision of HIV prevention for people who inject drugs, in particular bad laws and policies. He noted the ineffectiveness of compulsory detention and called for drug treatment to be voluntary and evidence-based. Although Thailand has a harm reduction strategy that includes needle and syringe programmes (NSP), implementation is limited. Thailand’s Council of State, the government’s legal advisory body, found last year that NSP provision would be illegal as it ‘promoted drug use’. Ms. Lawan Sarowat, representing the 12D network, spoke firmly about the rights of people who use drugs to be able to access appropriate health services, and the need to stop the rhetoric and start the implementation of harm reduction programmes in Thailand. Thai government officials were mixed in their responses to these interventions although there was general acknowledgement that drug users should not be categorised as ‘criminals’ but instead, as ‘patients’— although both terms are stigmatising and problematic given that most people who use drugs fall into neither category. There were a few clear issues that emerged from a day of in-depth and unusually open discussion on such a sensitive topic for Thailand. The first was around the issue of harm reduction. NSP is available in Thailand provided by the Global Fund CHAMPION IDU project led by PSI but coverage is limited as a result of the legal ambiguity introduced by the Council of State, which must be urgently addressed given the high rates of HIV and Hep C prevalence. The second issue was the need to review the methods adopted for ‘drug treatment’ in Thailand. An important part of this discussion focused on the need to clarify whether someone who uses drugs is actually in need of treatment given the majority of people who use drugs do so without becoming dependent. Global evidence suggests that only 10% of people who use drugs become addicted, so if there are 1.2 million ATS users in Thailand, in theory only 120,000 would need treatment—however there is a national target to treat 400,000 users. The related but equally important point is to ensure that any treatment provided is voluntary and evidence-based. Detention in military camps has yet to be proven as an effective drug treatment intervention. Finally, in discussing ‘effective legal frameworks’ the issue of decriminalising drug use was a pertinent one. With respect to the issue of the mass incarceration of people charged with drug offences this is a critical factor. Dr Apinun Aramrattana from Chiang Mai University reported that Thailand has roughly 246,000 people in prison (more than double the official prison capacity) with around 64% of these incarcerated for drug offences. While disaggregated data for those imprisoned for personal use offences is not yet available to us, we can expect that the number of people imprisoned for personal use is high given a recent study of 468 people who inject drugs in Bangkok found that 78% had been imprisoned, with some 48% reporting that they had experienced police planting drugs on them. Many of those now incarcerated in Thailand’s prisons are likely to be low-level traders and drug users, as they are more easy targets for police, rather than large scale traffickers and organised criminals. Subsequently the need to review both the criminalisation of drug use and proportionality in sentencing for drug offences is particularly relevant for Thailand. Furthermore, of those incarcerated for drug offences, an overwhelming proportion are for offences related to ATS (95.4%, compared with 2.7% for opium and heroin-related offences, and the remainder for cannabis, kratom and other drugs). The use and supply of ATS is a growing issue of concern for the region. The current harm reduction and policy responses are woefully inadequate, marking a need to invest more in developing effective and evidence-based measures for HIV prevention and drug treatment in relation to ATS use. It was clear during the seminar that decriminalisation of drug use is still a very challenging topic to raise for discussion in the Thai context. Many of the policy makers present deferred to public opinion, saying that Thai society cannot accept a pragmatic response towards drug use as they see it as a wrongdoing that requires harsh punishment. The question that we were asked by reform-minded individuals was how to influence the public when they held such an entrenched mindset towards drugs. But perhaps the more relevant question is how to dissuade the Thai government from using drugs as part of its populist approach to electioneering which further reinforces any misguided public perceptions. Thailand is not alone in facing these challenging issues and the Ministry of Justice should be commended for seeking to encourage a dialogue on drug control policies and approaches. However, there are some indications that other South East Asian nations are moving a little on some of the most difficult policy issues. Malaysia has scaled up harm reduction programmes for people who inject drugs and has also been moving towards the greater provision of voluntary drug treatment. Vietnam is also slowly waking up to the need to shift away from compulsory detention for drug users (no doubt actual implementation will be slow but there are encouraging signs), which follows a call by UN agencies earlier this year to governments in the region to close compulsory detention centres for people who use drugs. As a result, it is possible that Thailand could become more isolated in its futile pursuit of a drug-free nation without regard for the negative social, economic or public health impacts on its people. Continuing to be part of an international dialogue that shares experiences and lessons learnt will be a key factor in encouraging Thailand to develop more effective and humane drug policies.